Game publishers are under no obligation to provide access to games early so that reviews can be online by launch. For big titles, usually they find a way. Sometimes, one reviewer found with the new Tony Hawk, it's complicated. Here's Giant Bomb's Jeff Gerstmann, one of the most respected and tenured reviewers in the gaming press, explaining what he believed he had to do to have a day one review ready for Tony Hawk Ride. Jeff Gerstmann, Giant Bomb: We've gotten e-mails saying, hey, we're doing an event on Saturday, with Tony Hawk Ride. 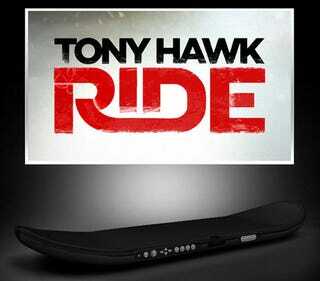 Tony Hawk will be there talking about the game. This would be your opportunity to come and play it for day one reviews. Brad Shoemaker, Giant Bomb: Really? Gerstmann: Twelve to three on a Saturday. Do you really want to read the Day One review I would write after fighting the public and maybe playing the game for 20 minutes? "The 20 minutes I played was awesome!" or "The worst thing ever! I couldn't learn how to play because this game has a learning curve because it's got an actual skateboard. [whispers] They're sending that game off to die." Gerstmann didn't attend the event. He bought the game instead. For the record Activision didn't offer early review access of the game to Kotaku nor supply a review copy in advance of release. As of this evening, the day of Ride's release, Metacritic listed only one review for the game. Kotaku checked in with a representative for the Activision regarding the details of that Saturday event. I'll update this post if I hear back.